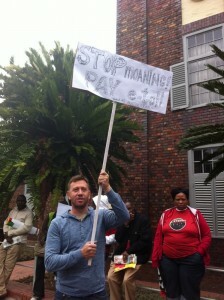 Discontent was expressed once again regarding the Transport and Related Matters Bill regarding e-tolling when opposition members complained that the Bill had been classified as Section 75 for national competence only, therefore denying the National Council of Provinces the process under section 76 of the Constitution whereby the Bill and its contents could be debated and approved at provincial level. Johannes Makgatho, department of transport, told parliamentarians of the select committee on transport, NCOP, that when the South African National Roads Agency Limited (SANRAL) Act was promulgated, electronic toll collection (ETC) was not envisaged in its current form. The development of the Gauteng Freeway Improvement Project (GFIP) had necessitated ETC and the Bill was necessary. 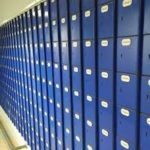 The Bill was described by DoT as being of vital importance for the collection of tolls, the lack of which would have a negative impact on the ability of government to raise capital for their infrastructure projects. 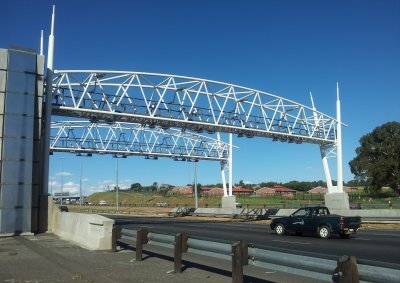 SANRAL had issued bonds to the tune of R24bn and the inability to collect tolls to repay the bonds would imperil the state guarantee provided to SANRAL, Makgatho said. Ms Suraya Williams, Principal Law Advisor from the Office of the State Law Advisors, told the committee that that the regular ‘substantial measure’ test was applied to the question of whether the Bill should be tagged under section 76 for provincial debate but according to this established constitutional process, the Bill had been found to be a Section 75 Bill. Who has heard of Cross Border Agency? 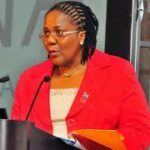 The Democratic Alliance said that it did not object to e-tolling in principle but considered there was a lack of public participation on the project and the process of e-tolling as a whole and this was unacceptable. Also all funds were to be collected by a body known as the Cross-Border Road Transport Agency, which they said was a relatively unknown entity and were deeply concerned that this body was competent. The DA added that this state entity had already been found unable to handle its own finances and got into difficulties handling just cross-border taxi industry matters. Mr Alex van Niekerk, Manager of the Gauteng Freeway Project for SANRAL, said the Cross-Border Agency had indeed experienced much difficulty initially with vehicles entering the country and travelling on roads which had not been tolled, but they had now built up experience with e-tolling and were ready for GFIP and national e-tolling as it built up. Mr van Niekerk explained that e-tolling would replace conventional toll plazas and that tolls would be recorded electronically in reference to barcodes which recorded the type and status of the vehicle in the same manner as prepaid airtime on cell phones. Existing toll plazas would remain but rather than manual payments, the plaza would read the tag and give access if there was credit on the account. He said the principle of tolling did not change at all, only the mechanism of tolling changed and “non-compliance at the time of travel could therefore be remedied after the fact.” No profit, he added, would be made by SANRAL in the collection of toll revenue and he added that technology for the GFIP was considered “cutting edge”. The Bill has now achieved NCOP concurrence and has gone forward for final reading. It then goes to President Zuma for assent. With the department of transport gazetting draft regulations for public comment dealing with exemptions from toll fees on Gauteng toll roads, the recent Gauteng regional court decision to put tolling on hold has caused a legal and financial implosion of considerable complexity. Written comment was invited until 9 May, 2012, the Gauteng Freeway Improvement Project having expected to be started on 30 April. The cancellation of the process sets an unfortunate precedent for e-tolling on highways around the country. The gazetted notices were published in terms of the South African National Roads Agency Limited (SANRAL) and National Roads Act of 1998, together with a notice making known the places at which tolls can be paid. On exemptions, commuter vehicle concerns were addressed inasmuch that taxis and buses, together with emergency vehicles, were exempted from paying toll fees. Exempted vehicles are to be issued with an e-tag for identification purposes when they pass through the tolling gantries. The notices explain how non-registered e-tag users and non-registered vehicle licence number users are to make payment. 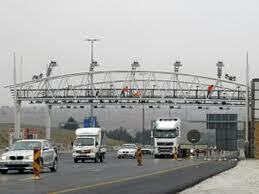 SANRAL is to have mobile pay stations located alongside the toll roads to enable motorists to make payments. Meanwhile Jeremy Cronin, deputy minister of transport, addressed the National Assembly a few days before the Gauteng regional court decision, answering criticism from opposition members parliamentarians. He had said earlier in Pretoria that e-tolling in Gauteng was the only viable way to pay for the R20 billion spent on improving the province’s freeways. Opposition MPs were requesting rather to implement a small fuel levy to cover the cost of the SANRAL 20bn project. Ian Ollis, shadow MP for transport, had complained it would cost over R1bn a year just to collect the fees and described it as “the world’s most expensive toll collection system”. He noted that the R20bn was being spent on a highway project that only involved about 180km of road. 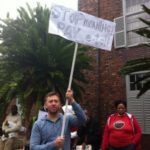 Cronin agreed that “the particular tolling option that had gone forward was very expensive” but added that any national levy, such as the one proposed on fuel, would be unfair to people living in other parts of the country who would be paying as a result for infrastructure in Gauteng. 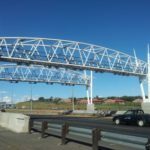 Cronin acknowledged that there was “great unhappiness” over the introduction of e-tolling and any further spending on the project had ” been put on hold”, he said, adding that paying off the project debt by increasing the fuel levy was not an option. Opening the debate in the National Assembly, Transport Minister Sibusiso Ndebele said South Africa had a responsibility to service the debt incurred when the project to improve the road network in the province was implemented. Minister Ndebele said he was “encouraged” by the fact that, to date, a total of 501 245 e-tags had been sold. At the time he was responding to the national budget where department of transport, received an overall R39-billion budget allocation for this financial year, which will rise to R48-billion by 2014/15. About R18bn of this is earmarked for roads. 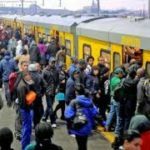 Returning to the point raised by Cronin that all spending was on hold, earlier in the week the ANC had issued its own statement on the matter welcoming the delay the implementation of the e-tolling system by a month indicating that they too were in doubt about the system. In a separate statement the DA’s Jack Bloom commented that in his view “the best thing for the government to do was to forget about e-tolling and move on to another funding method”, noting that damages would have to be paid in cancelling any contract but he repeated his colleague’s point that this might be cheaper than carrying on with a toll collection system that was as expensive as the road being built. Quite clearly the next move will have to come from the minister of transport or, perhaps, even President Zuma himself or his deputy. An appeal against the regional court’s decision is reported to be a lengthy process.